After using up all the rhubarb I brought home from North Dakota, I couldn't help but feel a little sad. 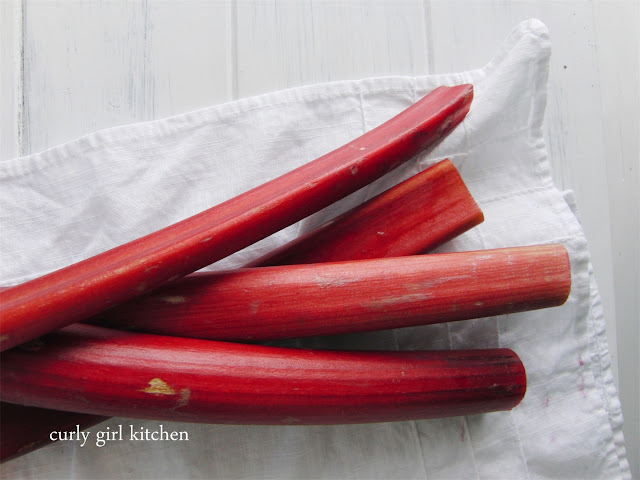 So when I saw the fresh, bright red rhubarb stalks in our grocery store, I had to buy some more. I'm always picking up ingredients without necessarily having a plan for what I'll make with them, but inevitably something will come to me. And it's not hard to think of ways to bake with rhubarb since it lends itself so nicely to fruit crumbles, loaf bread and even ice cream. 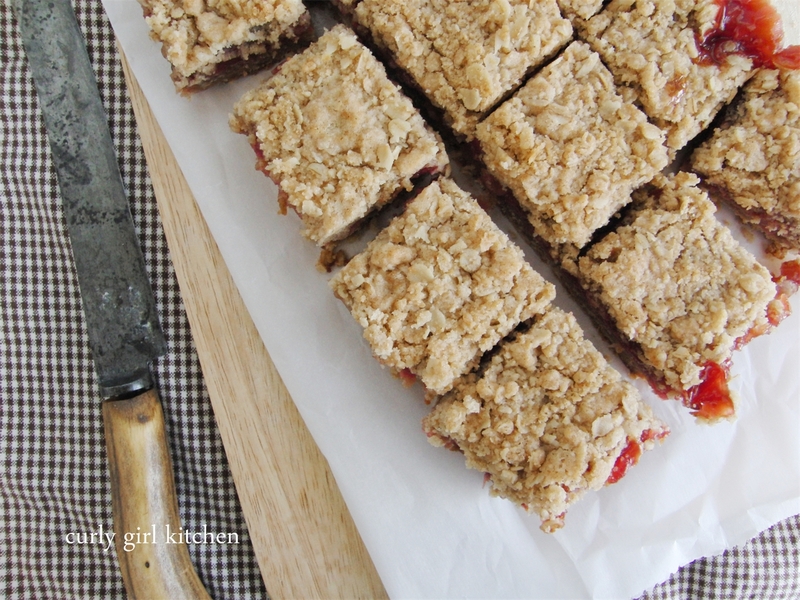 I thought of the oatmeal fruit bars my mom used to make when I was a kid. 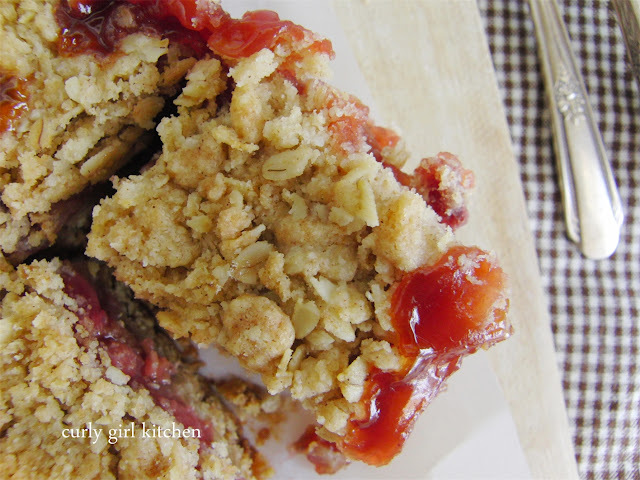 It was one of her go-to desserts to take to potlucks, and I loved the buttery layers of oatmeal cookie-like crust and topping, sandwiching a sweet, jammy fruit filling. Especially blueberry pie filling. 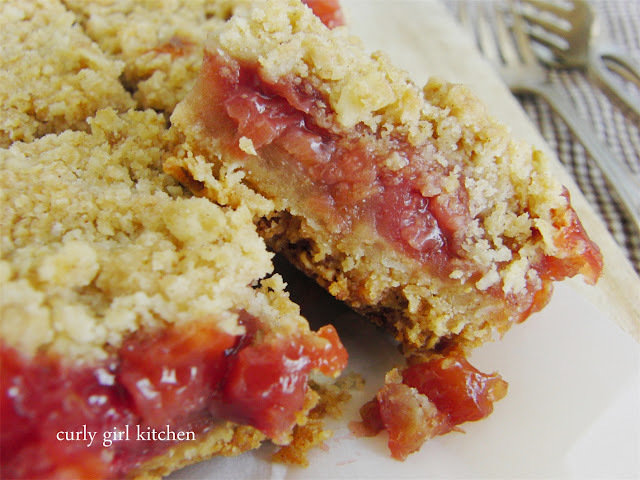 So after the rhubarb sat in the fridge for a few days, I pulled out the flour, brown sugar and oats, butter, salt and cinnamon, and made a crumbly dough for cookie bars. One of the things I love about this type of cookie bar is that the dough serves a dual purpose, both for the crust and the crumb topping. I think every day should have a little crumb topping, because it just makes everything better. 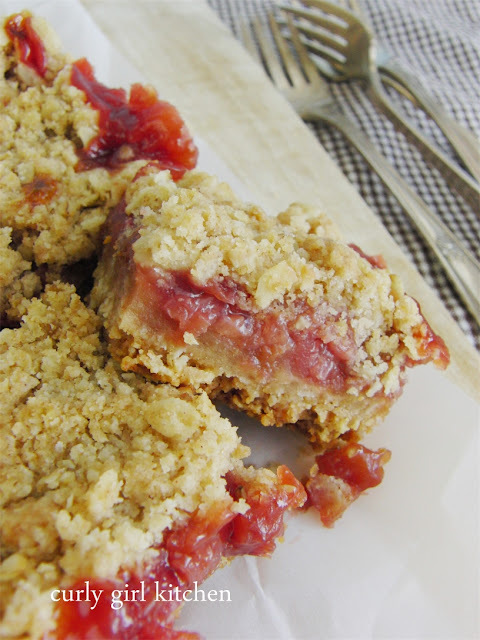 I tossed the rhubarb with brown sugar, lemon juice and vanilla, with a little strawberry jam to bring it all together and some flour to thicken it. Other jams would be nice with the rhubarb, too... maybe apricot or peach? In your food processor, or with a pastry cutter, combine the crust/topping ingredients until pea-sized pieces of butter remain. Reserve 1 ½ cups of the crumbs for the topping (chill in the refrigerator until needed), and press the remainder of the crumbs firmly against the bottom of the baking dish. Bake crust for 20 minutes. Meanwhile, in a bowl toss the rhubarb with the sugar and flour until all the fruit is coated. Stir in the jam, lemon juice and vanilla. After the crust has baked for 20 minutes, remove from the oven. Reduce oven temperature to 350. Spread the rhubarb mixture over the hot crust. Bake for 30 minutes. Sprinkle the reserved crumbs over the fruit and bake for an additional 20-25 minutes until topping is golden brown. Let cool on the counter for at least two hours to set before slicing into squares. These can be served slightly warm or room temperature, and are wonderful with ice cream. 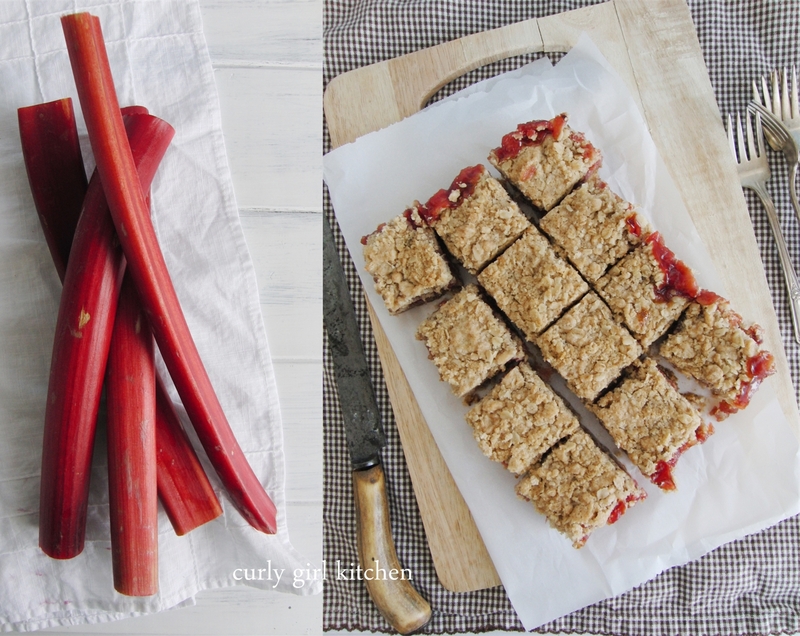 I have been watching the rhubarb patch and picked some today and baked these squares. They turned out perfectly and we each had one still slightly warm with some vanilla ice cream for dessert. They are delicious. Great recipe! Went out and pick probably the last batch today and whipped these up! Recipe is spot on and thanks for sharing! Delish! I've been looking for a great recipe and I can't wait to share this one with friends! :) Thanks for sharing! 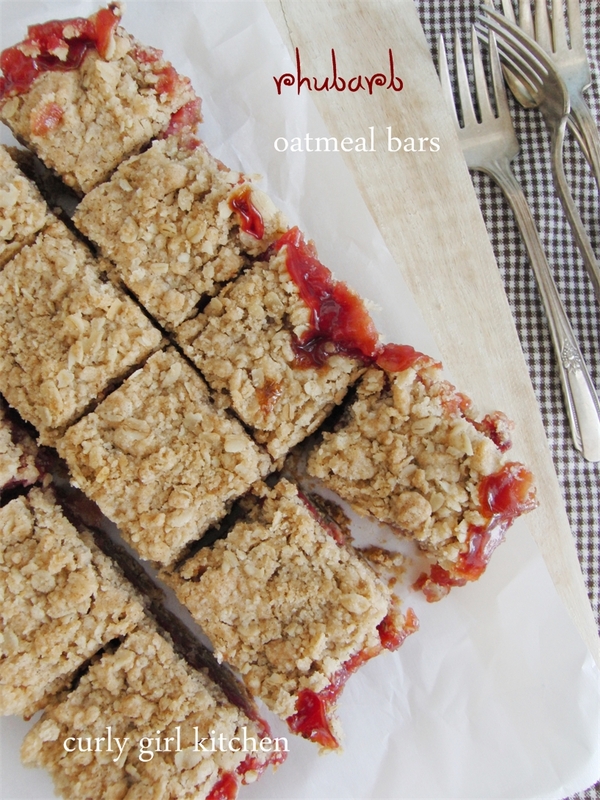 What type of oats do you use with your rhubarb-oatmeal bars? Thanks. Just made these and ate one warm. Delicious !